As we have mentioned, surprises in the dance between the Earth and the approaching Planet X have, overall, proved a disaster for the cover-up, and a benefit for the common man. For all the exacting detail we relayed on the effects of the shift and precursor events such as the increasingly erratic weather, worldwide crop disasters, increasing illness, the lineal increase in earthquakes and volcanic activity, and most impressively the exact location during 2001 and into May, 2003 where the inbound Planet X could be sighted in the skies, there were occurrences we left out, deliberately. No mention was made of the orbit changes the Earth would take in her attempted evasion of Planet X, lifting up to a higher Ecliptic plane and lately halting and reversing her orbit. No mention was made of the tilting the Earth has done, while in the grip, magnetically, of the monster magnet Planet X. No mention was made of the reflected light the Moon and Venus would show at this time, absolute evidence of light from Planet X. Taken by surprise, the cover-up artists stand in stunned silence while the common man makes note. In that we wish to continue to cause the cover-up to stumble, we will not reveal cards yet to be played, steps in the dance between the planets that we know will occur, but the cover-up artists will be ignorant of, and thus stumble and expose themselves. 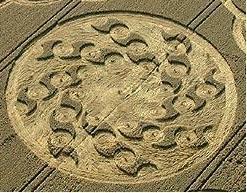 But it is no secret that the Sweeping Arms of the Sun, occurring as the classic crop circle depicting them shows, about 8 times a year, with regularity. These arms are what cause the planets to all orbit in one direction, as they are swept in that direction. The last arm swept by Earth around Dec 25, the next expected by the anxious humans watching the drama to start around Feb 9, 2004. Each sweep causes the Earth to move forward toward Planet X, and the monster moving in a retrograde orbit to jump over the arm toward Earth, suddenly. The last sweep halted the Earth in her orbit, and she is now scuttling backwards in an attempt to escape. This has put continuous stress on the Earth, as the sweeping arms are always present to some extent, pushing her forward into the magnetic jaws of Planet X. A trap. A squeeze. An Unshakable Grip. The next sweep will force the two planetary magnets closer together, with the Earth, as always, the loser. If crust movement disasters have been on the increase, this is only a hint of what will occur when the magnetic grip on the Atlantic Rift forces serious and steady slowing in the Earths rotation. Quakes will increase, disasters related to crust adjustments will increase, as though from a cry to a scream. Take the effect of exploding gas lines and refineries, ruptured water mains and dams, collapsing buildings and industrial accidents, derailing trains and capsized ferries and ocean going vessels, disconnected or dropping bridges and emerging sinkholes, and multiply them ten-fold. Serious slowing will commence, a certain sign we have mentioned as rule one in the watch for when to expect imminent disaster. No longer confused by manipulation of sunrise and sunset times by the Navy, no longer confused by tilting or bobbling of the Earth, but a clear steady beat of the drum warning of certain and imminent disaster.